Leon Guerrero pledges to get GMH funding - KUAM.com-KUAM News: On Air. Online. On Demand. 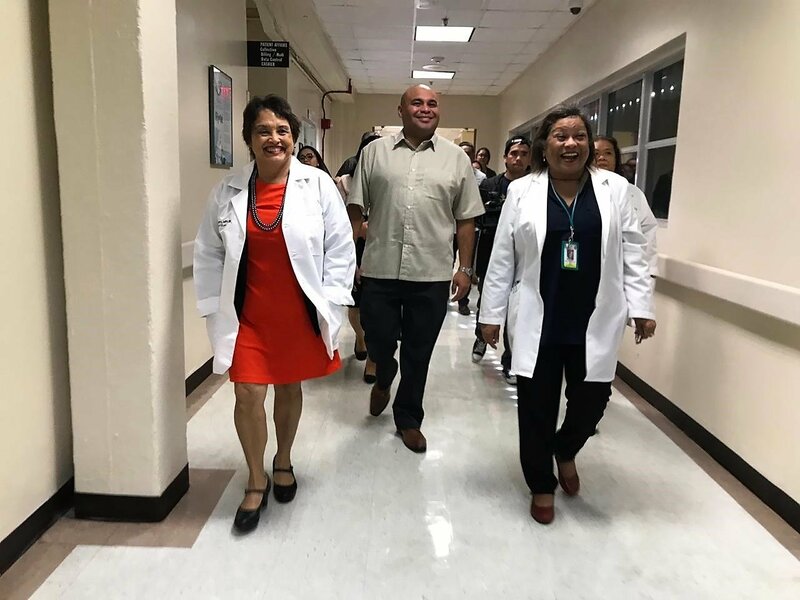 If the Guam Memorial Hospital needs money, it's going to get it. That was the pledge by Gov. Lou Leon Guerrero during a meeting with GMH employees Monday. The governor, who's still a registered nurse, looked quite at home in her hospital smock. During a question and answer session before her tour of the facility, she was asked how she'd address the hospital's chronic $30 million annual budget shortfall. "We don't really need to wait for a dedicated funding source to fund the hospital," she said. "My contention has always been that if the hospital needs $30 million from the government, to make sure that our patients and our people are given the quality of healthcare, then we need to give the $30 million," she responded. To help bridge the gap GMH needs to reduce costs and improve efficiencies. Last week the Centers for Medicaid and Medicare approved a long overdue adjustment to the GMH base rate that will mean an additional $6 million a year, she said. But the governor plans to make up the rest of it through increased tax collections. "We're looking at providing automation and technology at the department of revenue and tax so that they can collect the monies right away," Leon Guerrero said. The governor also listened to a long stream of employee concerns: two of the four emergency operating rooms are down because of broken equipment. Nurses continue to leave because of non-competitive pay. Supplies are short, the roof leaks, the electrical room needs replacement, and the list goes on. Then there's some $61 million in federal money that requires the hospital to come up with matching funds. "We could lose it by the end of September of 2019, I think," she said. "And when I go to D.C. next week that's one of the things we'll be asking if we can get an extension. I know the other states are also asking for an extension in their expanded Medicaid program."